How do I add a semi-transparent color over an image in gimp? Example of what I'm trying to do is the radar maps in MechWarrior 3: you have a "satellite view" of a landscape and the whole image has a semi-transparent green hue and you can see all the details of the landscape. It's as if it were done in black and white, but it's different shades of green. What I am trying to do: the radar maps from Pirate's Moon, MechWarrior 3's expansion pack, are not colorized this way, and I wish to duplicate the idea above on those maps, and I am using Gimp... any ideas how I can do this? In short: Add a layer, fill it with the desired color, and change the layer opacity. This - and working wit layers in general - is something you want to be able to do without thinking about it. Layers are one of the basic concepts of any reasonably complex image manipulation tool. You will find the button to add a layer there (lower left of the dialog). It is also possible to do this via the menu, or with a keyboard shortcut. 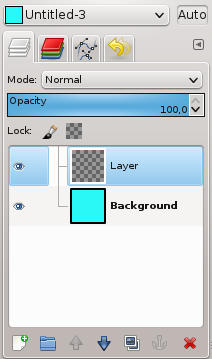 In order to get the color into the layer, make sure that it is active in the layers dialog (in the image above, it is the one called "Layer"), and then use Edit->Fill with FG Color from the menus. For this, let's go back to the layers dialog. You will notice the opacity slider there - in the image above, it is set to 100, meaning the layer is totally opaque. Change this to some lower value and see how this affects your image. For the experienced user, there are some possible shortcuts here - for example, one can adjust the color first and create a layer that is already filled with the color. Or copy an existing layer and fill that instead, this is especially useful if the layer size is different to the image size. But the description above should cover the basics. 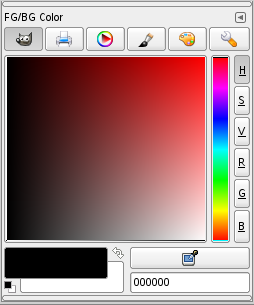 How to colorize a layer with semi transparent borders to a specific color in GIMP?